In this tutorial, you will learn Python commands to install and to run Jupyter Python Notebook in Windows/Linux/MacOS using pip tool. Jupyter is an open source project which provides the interactive platform for executing programming code. It allows you to add a comment and to make it more explanatory. If you want to install Jupyter for Python, Jupyter is available as python module for Python version 2 and 3. It is easy to install it using pip tool. You can install the Jupyter Notebook from the Python standard library with simple commands. Here, the first command is to upgrade the pip. It is always good practice to upgrade pip before installing any Python module. Note: Managing Python module is crucial for Python developer. Learn more about managing Python packages using Pip. Once you installed it, run following command to run the notebook. Remember, pip is package manager tool by default comes with Python binaries. Older Python 3 version has tool pip3. So you have to use pip3 instead of pip. Commands for installing Python packages for Python 2 versions are pretty straightforward. Jupyter creates the localhost server to execute the Python programs. Running Jupyter notebook command will open the notebook page in the new tab of the browser as localhost. You can see the local directories in your browser notebook. Select the directory where do you want to save the Jupyter notebook program. Then click on the new drop-down menu option (right-top option). Select the Python version. (Here I have installed notebook for Python 3). 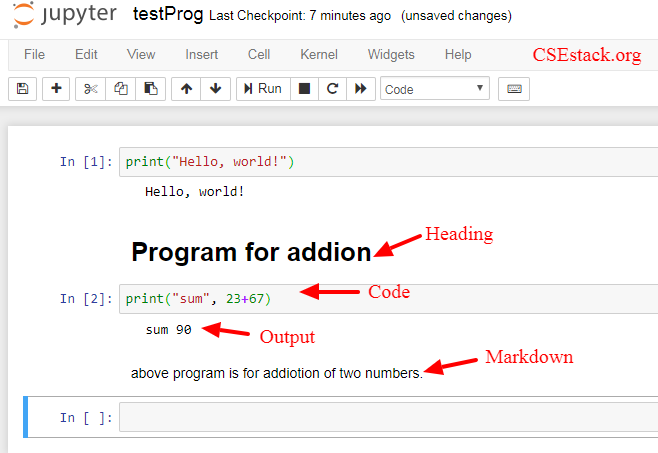 It will open the new tab in your browser where you can write your first program. Write your Python code and run. You can rename the Jupyter file by double-clicking on it. I have renamed it to testProg. In above Image, you can see the different cell where you can split your code. It’s pretty easy to execute Python program, isn’t it? You don’t need to execute any command line code. Just click on Run, you have done with your Job. Let’s find little more about using different types of cell in Jupyter. There are majorly three types of cell in Jupyter. This cell is to write and execute actual Python code. This is advance feature comes with Jupyter where you can write simple HTML commands to decorate the text inside the browser. As its name, with this cell, you can add heading to your Python Jupyter program. If your program has a large number of lines and cells, it is good practice to add headings. It is easy for understanding and maintaining Python code. You can add as many cells in the file before and after the selected cell. 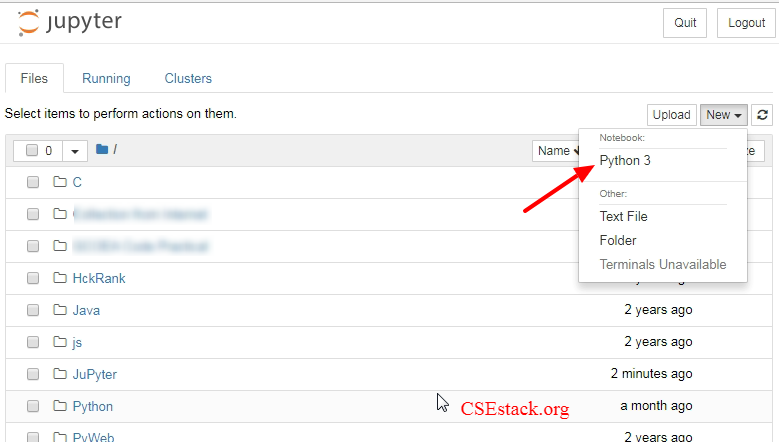 You can mark each cell with different tags – Code, Markdown, Heading. Only lines from the code cell will be executed. You can see the output of the program just below the code cell. That’s all from this tutorial to install and run Jupyter Python Notebook. Once you start using it, you will just love. Running Python program in Jupyter is pretty easy in the browser as compared to running Python code in the different text editor. You don’t need to run command every-time to execute the code. This tool is the best to explore data science libraries and projects. If you are writing or practicing coding, adding explanatory comments for your code will help. Many of the Python tutors use Jupyter in their classroom to teach Python and other programming languages. Even I am using Jupyter in my Data Science course. This article had covered all the detail required to execute your Python code in the Jupyter notebook. For more detail, you can visit Jupyter Official website. What’s your experience or the best thing you like about Jupyter? Shout out in the comment.